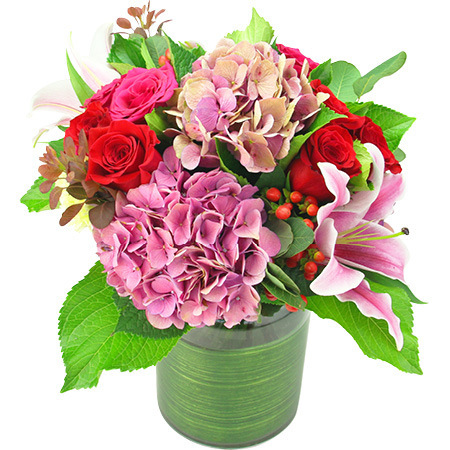 Change things up this Valentine`s Day 2018 with our vase of flowers featuring a summery, romantic blend of fresh blooms including ruby red roses, berries, soft pink hydrangea and fragrant oriental lilies. These luscious flowers in a vase for Valentine`s Day are a beautiful way to express love to your nearest and dearest. It is even a gorgeous gift idea to send a special friend! A wonderful altenative to delivering red roses, this sweet flower vase really offers something a little different for both sweethearts and friends alike! Please Note: Due to the busy nature of the day, we are UNABLE TO GUARANTEE SPECIFIC DELIVERY TIMES. Valentine`s Day flower delivery will be made anytime between 7am to 5.30pm (work addresses) and 7 - 7pm (home addresses). No re-directs will be possible if the recipient has left the delivery address for the day, however we will try, where at all possible, to accommodate your needs if this situation does arise. Also note that no changes to orders can be made after 18:00 AEST Monday 12th February for Wednesday 14th deliveries. Please make sure to double check all your contact information, addresses and additional delivery instructions when ordering your roses online for Valentine`s Day to ensure smooth delivery!